Click Here if you are measuring for a Trapezoid shaped bench cushion. 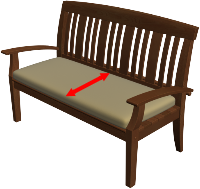 As with every cushion, we require you to specify a thickness for bench cushions. Cushion thickness is a matter of preference however choosing a cushion that is too thick or thin could result in an uncomfortable seating experience. The best way to get the cushion thickness that is right for your bench frame is to measure an existing cushion. If an old cushion is not available to determine an appropriate thickness, you can try to stack a book or two on your bench to get a rough idea of how thick your cushion should be. Remember that you must measure the actual area of your furniture that you would like to be covered by the cushion, not an old bench cushion. Click Here if you are measuring for a Trapezoid shaped seat cushion. As with every cushion, we require you to specify a thickness for seat cushions. Cushion thickness is a matter of preference however choosing a cushion that is too thick or thin could result in an uncomfortable seating experience. The best way to get the cushion thickness that is right for your chair frame is to measure an existing cushion. If an old cushion is not available to determine an appropriate thickness, you can try to stack a book or two on your chair seat to get a rough idea of how thick your cushion should be. 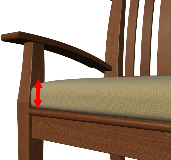 NOTE: If your chair frame has arms, make sure that the seat cushion is not too thick as this could result in the arms being too low for the person sitting on the chair. 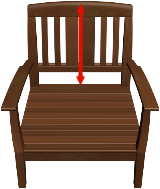 The seat cushion width is measured from side to side as shown in the image on the right. Remember that you must measure the actual area of your furniture that you would like to be covered by the cushion, not an old seat cushion. The seat cushion depth is measured from front to back as shown in the image on the right. As with every cushion, we require you to specify a thickness for chair cushions. Cushion thickness is a matter of preference however choosing a cushion that is too thick or thin could result in an uncomfortable seating experience. The best way to get the cushion thickness that is right for your chair frame is to measure an existing cushion laying flat on the ground. If an old cushion is not available to determine an appropriate thickness, you can try to stack a book or two on your chair seat to get a rough idea of how thick your cushion should be. Remember that you must measure the actual area of your furniture that you would like to be covered by the cushion, not an old chair cushion. We require the size of the actual cushion itself. If you are ordering a two piece chair cushion you will need to deduct the thickness of the chair seat cushion from the overall length of the back of the chair. As with every cushion, we require you to specify a thickness for chaise cushions. Cushion thickness is a matter of preference however choosing a cushion that is too thick or thin could result in an uncomfortable seating experience. The best way to get the cushion thickness that is right for your chaise frame is to measure an existing cushion laying flat on the ground. If an old cushion is not available to determine an appropriate thickness, you can try to stack a book or two on your chaise seat to get a rough idea of how thick your cushion should be. Remember that you must measure the actual area of your furniture that you would like to be covered by the cushion, not an old chaise cushion. We require the size of the actual cushion itself. If you are ordering a two piece chaise cushion you will need to deduct the thickness of the chaise seat cushion from the overall length of the back of the chaise. As with every cushion, we require you to specify a thickness for ottoman cushions. Cushion thickness is a matter of preference however choosing a cushion that is too thick or thin could result in an uncomfortable seating experience. The best way to get the cushion thickness that is right for your ottoman frame is to measure an existing cushion. If an old ottoman cushion is not available to determine an appropriate thickness, you can try to stack a book or two on your ottoman to get a rough idea of how thick your cushion should be. Remember that you must measure the actual area of your furniture that you would like to be covered by the cushion, not an old ottoman cushion. The trapezoid cushion depth is measured directly from the front of the cushion to the back as shown in the image on the right. 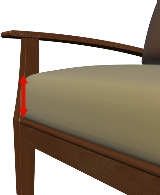 DO NOT measure the angled sides of your furniture or existing cushion as this will result in a cushion that is too deep. The trapezoid cushion front width is measured from corner to corner as shown in the image on the right. Remember that you must measure the actual area of your furniture that you would like to be covered by the cushion, not an old cushion. Trapezoid cushions wider than 50″ may require a seam in the center when selecting striped fabrics. The trapezoid cushion back width is measured from corner to corner as shown in the image on the right. As with every cushion, we require you to specify a thickness for trapezoid cushions. Cushion thickness is a matter of preference however choosing a cushion that is too thick or thin could result in an uncomfortable seating experience. The best way to get the cushion thickness that is right for your trapezoid frame is to measure an existing cushion. If an old cushion is not available to determine an appropriate thickness, you can try to stack a book or two on your ottoman to get a rough idea of how thick your cushion should be.